Well, what do you know. Today's New York Times has a front page article (below the fold, but still) on the environmental impact of meat. It sure looks like the issues surrounding meat production and consumption we've been talking about for a while now are finally going mainstream. Which is a good thing since, as a nice companion piece by Ben Adler in the American Prospect points out, the environmental bigwigs to this point haven't really wanted to dwell on the subject at all. "How convenient for him: He's a vegetarian," sneered a Pittsburgh Tribune Review editorial. "Dr. Pachauri should be more concerned about his own diet. A new study shows that a deficiency of vitamin B-12, found primarily in meat, fish and milk, can lead to brain shrinkage." Boris Johnson, London's outspoken mayor, posted a long screed on his blog, declaring, "The whole proposition is so irritating that I am almost minded to eat more meat in response." ...In fact, the environmental movement has largely ignored meat consumption... Al Gore has never mentioned the environmental impact of meat consumption. Green groups tell their conscientious constituents to trade in their SUV for a Prius and buy compact-fluorescent light bulbs but haven't dared suggest that they give up steak. The easiest solution - for everyone to eat less meat (not no meat, by the way, just less) - may be one of the hardest of our many and varied environmental nuts which need cracking. Though, if you want to try, Mark Bittman has some good suggestions. Attacking the problem less directly, by making meat more expensive through cracking down on CAFOs, forcing agriculture to participate in emissions pricing systems and stopping deforestation (not to mention educating consumers on the true impact of meat) is hard enough. But to have to simultaneously guard against biotech companies' introducing "magic" cows and pigs who fart less methane or thrive more quickly seems well nigh impossible. the refuse from thousands of pigs is combined with local waste materials (outdated carrot juice and crumbs from a cookie factory), and pumped into warmed tanks called digesters. There, resident bacteria release the natural gas within, which is burned to generate heat and electricity. The farm uses 25 percent of the electricity, and the rest is sold to a local power provider. The leftover mineral slurry is an ideal fertilizer that reduces the use of chemical fertilizers, whose production releases a heavy dose of carbon dioxide. For this farm the scheme has provided a substantial payback: By reducing its emissions, it has been able to sell carbon credits on European markets. It makes money by selling electricity. It gets free fertilizer. And, in a small country where farmers are required to have manure trucked away, it saves $190,000 annually in disposal fees. That's my kind of win-win. With the fronts on the climate battle literally everywhere. I suppose the best news really is that this story has finally broken through. That's something, right? I agree with you that cutting back one's meat intake is an effective and manageable way to live more responsibly. That's why I work for Meatless Mondays, a campaign dedicated to encouraging Americans to stop eating meat on Mondays. If everyone stopped eating meat just for one day per week, meat intake would go down 15%. 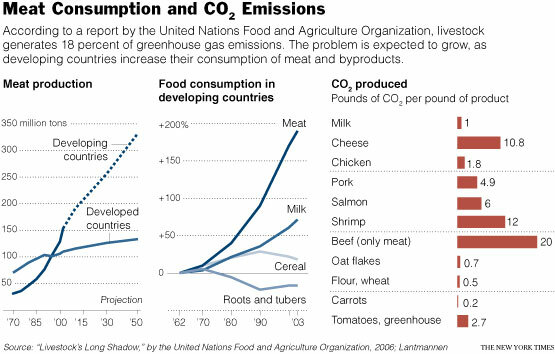 Not only would that reduce greenhouse gas emissions significantly, but cutting out meat once a week significantly reduces one's risk of heart disease, cancer, diabetes, and stroke- the four leading causes of death in the US, all preventable. Look at that. The chart shows chicken as producing less CO2 than tomatoes. No burping, I guess. I wonder if they count the CO2 used to raise the feed for the chickens? Still, its impressively low, relatively.